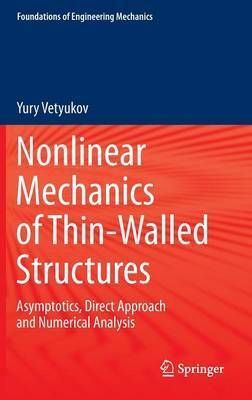 This book presents a hybrid approach to the mechanics of thin bodies. Classical theories of rods, plates and shells with constrained shear are based on asymptotic splitting of the equations and boundary conditions of three-dimensional elasticity. The asymptotic solutions become accurate as the thickness decreases, and the three-dimensional fields of stresses and displacements can be determined. The analysis includes practically important effects of electromechanical coupling and material inhomogeneity. The extension to the geometrically nonlinear range uses the direct approach based on the principle of virtual work. Vibrations and buckling of pre-stressed structures are studied with the help of linearized incremental formulations, and direct tensor calculus rounds out the list of analytical techniques used throughout the book. A novel theory of thin-walled rods of open profile is subsequently developed from the models of rods and shells, and traditionally applied equations are proven to be asymptotically exact. The influence of pre-stresses on the torsional stiffness is shown to be crucial for buckling analysis. Novel finite element schemes for classical rod and shell structures are presented with a comprehensive discussion regarding the theoretical basis, computational aspects and implementation details. Analytical conclusions and closed-form solutions of particular problems are validated against numerical results. The majority of the simulations were performed in the Wolfram Mathematica environment, and the compact source code is provided as a substantial and integral part of the book.